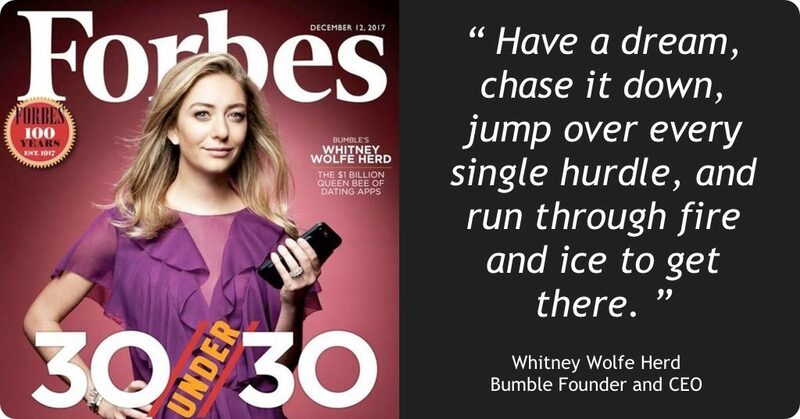 Stout Magazine gives up it with a well-earned #StoutSHOUT for Bumble’s Whitney Wolfe Herd, in recognition of her phenomenal resilience and success. From triumph to tumble and back to triumph again, online dating’s “Queen Bee”, Bumble Founder and CEO Whitney Wolfe Herd, has one of the most fascinating tales of skyrocketing success. We’re bringing you Whitney’s amazing story to celebrate our month-long focus on innovation. Join us for a look at the bold, brave and determined #Stoutways she has exhibited as a Forbes “30 Under 30” entrepreneur and the founder of the rare “unicorn” – a company valued at over $1 billion! But the passion and energy that led to her early success remained inside her. After toying with the idea of a women-only social support network, she was persuaded by Badoo founder Andrey Andreev to take another swing at the world of online dating. Together, they created Bumble. For 79% of the company, Andreev would supply Badoo’s infrastructure, his knowledge base, and an initial investment of about $10 million for Bumble’s launch, with the promise of additional funds to support growth. Herd would retain a 20% share, along with the titles of both Founder and CEO – and free reign to operate the company as she saw fit. Three years later, Bumble has 22 million registered users and more than 70 employees – most of them women – at their new headquarters in Austin, TX. And their most recent company valuation came in at over $1 billion. Now THAT is #Stout. Looking to #BringYourStoutOut and make your success journey a reality? Here’s Whitney’s advice to fuel fellow entrepreneurial go-getters. Herd turned down a $450 million buyout offer from the Match Group earlier this year. Now, her company is valued at over $1 billion. Never put up with poor treatment. Herd sued Tinder for sexual harassment, after allegedly being addressed as “whore” and “gold digger”, bombarded her with inappropriate text messages, and wrongly stripped her of a cofounder title. Herd says that she doesn’t “harbor resentment toward anything or anywhere or anyone – I’m too busy.” But there’s no doubt that success of her magnitude is a welcome reward for refusing to crumble. As Forbes writer Clare O’Connor puts it, “Rather than sulk about Tinder, Herd decided to compete against it.” Not only did she not crumble, Herd stayed in the same competitive space, and beat her former company at its own game. Before creating Bumble, Herd was pursuing a women’s friendship network she had dubbed Merci. 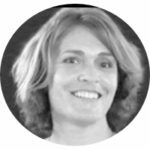 She even initially turned down a potential backer who wanted her to stay in the dating app industry. “I’m starting a company, and I don’t want to be in dating,” she told him. However, investor Andrey Andreev convinced her to stay where her skill set was strong – and that company because Bumble instead. When you’ve got a good thing, expand. Check out another hot innovation in the world of online dating with Stout’s fascinating look at new app LUCK.